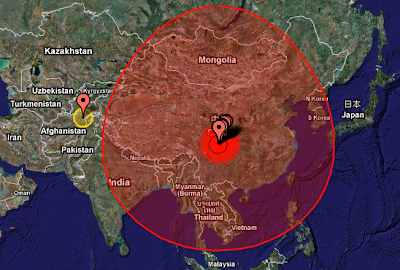 A series of massive Earthquakes hammered China this morning, the largest of which registered 7.8 on the Richter scale. How big is 7.8? The image below from my Earthquake map mashup shows that the 'rumble zone' (the area over which the quake could be felt) covered all of China. There's been over a dozen after-shocks registering over 5, so the 'impact' zone is harder to view, but if you look at the 'Australia' tab they're only showing the largest quake which gives a better idea of its scale. For comparisons sake the 'damage zone' (the area susceptible to severe damage) covers an area about the size of Ohio or Austria. In the image below it's represented by the darker red circle about the size of Thailand. The humanitarian result of a quake of this size is predictable. You can read more about the effect of a quake of magnitude at Google News.